Metal Gear Solid creator Hideo Kojima is one of the few auteurs in video gaming, mostly because you can usually count on him to bring a certain level of outrageous insanity to the games he creates. Last year, he performed a daring escape from pachinko game developer Konami and hitched his wagon to Sony, announcing a mysterious joint venture and the revival of his Kojima Productions brand in the process. Now, with E3 in full swing, Kojima took the stage during Sony’s press conference to reveal the thing he’s been working on. Thankfully, any concerns that Kojima fans might’ve had about this tumultuous year dampening his spirit can now be put to rest, because the short teaser he debuted for his new game might be the single weirdest goddamn thing he’s ever done. 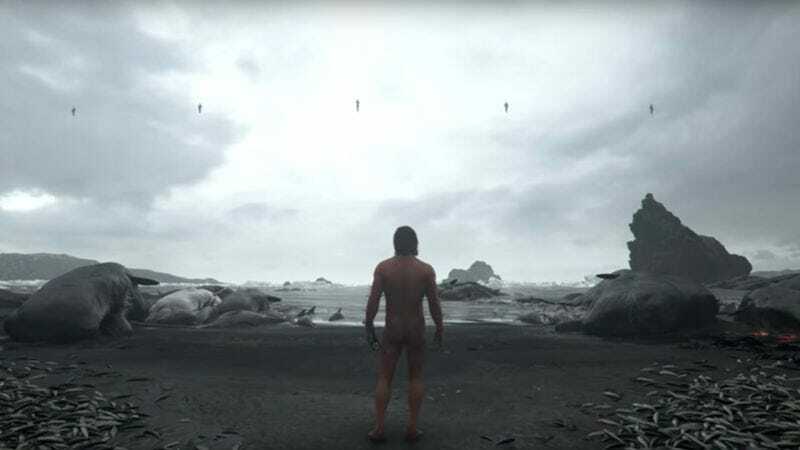 As you can see, the trailer prominently features a totally naked version of The Walking Dead’s Norman Reedus—who was also set to star in Kojima’s Silent Hills before Konami canned it—as he holds a tiny baby on a beach covered in dead sea creatures. There’s a lot to unpack beyond that, though, like Reedus’ c-section scar, the ghostly handprints, his sci-fi handcuffs, the chain of USB sticks or whatever around his neck, and of course the floating figures looking down on this inky black world of death. It’s weird, it doesn’t say anything about what kind of game Death Stranding will be, and yet it’s all somehow really exciting. In other words, Hideo Kojima is back.